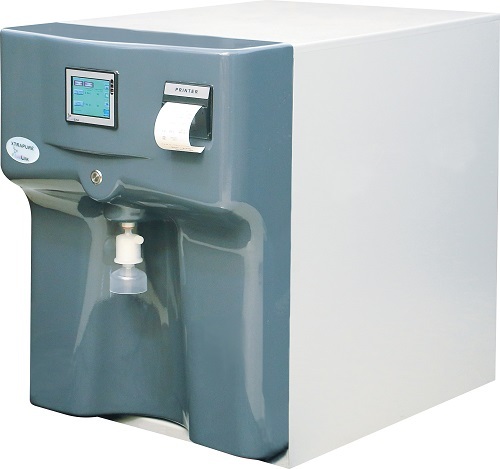 Lablink XtraPure Water System provides you a reliable and compact system which produces Ultra-Pure Water System always ensures high comfort at low operating cost. XtraPure System is equipped with reverse osmosis (RO) and additional filtration system to produce de-ionized water. The deionized water can be dispensed straight from the reservoir. Further Ultra-Pure Water is produced with a combination of optimized cartridges with UV & polishers. Other special polishers & 0.2 µm filter makes water XtraPure. The system comes with a touchscreen display with log book, alarm, and print (optional) facility. The display shows online conductivity & temperature of feed & XtraPure water. The input water required is DM water / RO water or Municipal Water. Easy to install, repair, plug, and play. The system has calibrated conductivity meters. Design of the instrument is electrically and electronically safe as the control box never comes in touch with water which enhances safety.